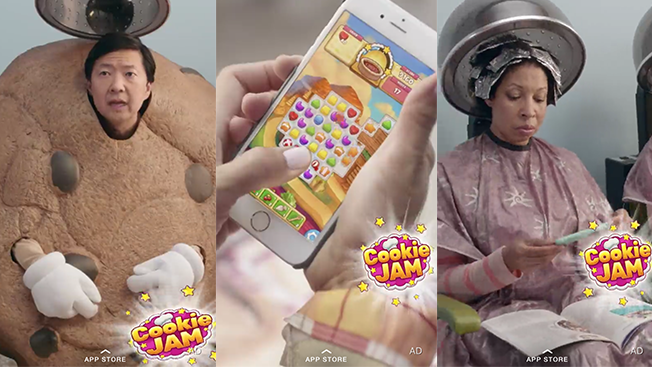 Today, a short video ad promoting SGN's mobile game Cookie Jam is running within iHeartRadio's Discover channel—the app's hub of daily content from publishers. The promo is a shorter version of a 30-second commercial Cookie Jam created in September with actor Ken Jeong, who plays a giant cookie. The Information first reported that Snapchat was eyeing app-install ads last week. A piece of copy at the bottom of the ad reads "app store," instructing users to swipe up to download the app. Similar to Facebook and Twitter's app-install ads, people can download the game straight from Apple's App Store without leaving Snapchat, which essentially built a downloads center to make the process seamless. App-install ads are the latest step in Snapchat's rise as a bona fide advertising player. That ad format is a staple of all of the major tech companies, including Facebook, Google, Twitter and Tumblr. Facebook, in particular, is credited with building a major mobile business off of app-install ads. At the same time, Snapchat is reportedly building an API into its platform that will help brands measure and target their campaigns. App-install ads could be seen as the first step in building out that technology, since Snapchat will be able to give brands data on how many people downloaded an app, which agencies have recently cited as one of the major holes in the platform's advertising abilities.